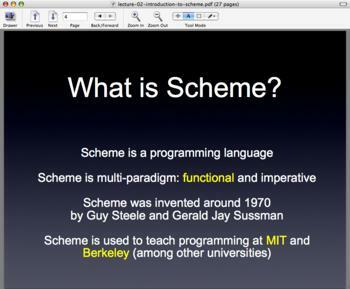 As you all know by now, I am currently teaching the Scheme programming language to my 2nd year students as a means to master the functional programming paradigm. I started four weeks ago with a general introduction on programming paradigms and on the necessity to at least know the most important ones in order to become a decent programmer. As my students had already studied imperative and object-oriented programming become coming to my class, I offered them to teach functional programming (using Scheme), logic programming (using Prolog in principle) and scripting (using Ruby). This first lecture can be downloaded here. The following week, I introduced Scheme by putting a lot of accent on the evaluation of expression and the definition of simple (mathematical functions). The lecture, which is available here, was followed by a lab sheet where the students were introduced to DrScheme and were asked to write a number of simple functions (like fahrenheit->celcius). 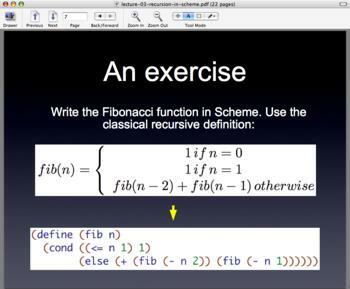 The next lecture was on recursion and I focussed on a number of mathematical functions like factorial, fibonacci, square root using Newton’s successive approximation etc. I spent some time introducing the concept of tail-recursion to them as well as the tail-recursion optimization that Scheme has to do. runs in constant space (i.e. there are no recursive function calls at runtime) even though it is expressed recursively. During the lab, the students implemented and traced a number of recursive functions (using the tracing facilities found in MzScheme). They implemented o+’s friends, o-, o*, o/, o^, o=, o< and o> (corresponding, of course, to our usual +, -, *, /, ^, =, < and >) using tail-recursion so that they run as quickly as possible. 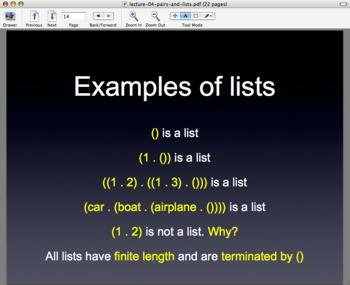 The last lecture which I had last Friday was on pairs and lists, the most fundamental compound data structures found in Scheme. I introduced them to car and cdr and showed them a number of fundamental algorithms acting on lists (like length). During the lab, I asked the students to implement a simple database of students and marks and this is inspired by what I read in Practical Common Lisp. My lectures have been cool up to now. The students are lively and responsive to my jokes and “parentheses”. The labs also are going on nicely with students who are really learning new things and having fun in the process. So I not exactly doing “beuhhhh beuhhhh”. Rather I’m adapting what the best do to cater for our own students. What’s nice is that the latter like the lectures and the lab sessions. I can easily see that in their eyes. And they are actually learning very important programming techniques. 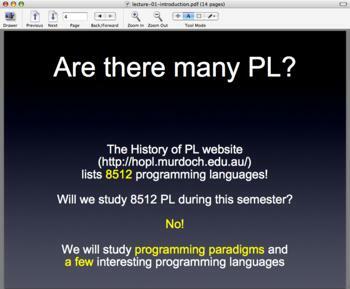 Looking at the first slide “…lists 8512 programming languages!”, which is wow a huge and very impressive number indeed! !, reminds me about a telling article (http://www.bitwisemag.com/2/The-Next-Big-Thing-In-Programming) which I recently read on bitwisemag. I recommend everyone of you to have a glimpse at it (actually it may perhaps unlock the future). So why are there so many PLs??! Hmm simply because most of them are YACLL (‘Yes Another C-Like Language’)!!! How do these languages really differ? Yeah you got it…a great deal of them are structured the same way with slight variations in the syntax. …In the long history of programming they will, ultimately, all be seen as ‘more or less the same thing’ doing ‘more or less the same job’. …These are all, in their way, useful languages. But they are devoid of Big Ideas. Yes, all of us must be wondering about what Big thing or breakthrough to loom up next in programming, if any?!!! Up to now, “…the goal has been to get the job done rather than to change the nature of the job itself”. The future is perhaps already set – and it’s YACLL!!! I desperately hope I’m wrong on that. What about this? Or this? Or simply this (or this)? Languages always crop up…but will they stand the test of time? This is what is at stakes!! For example, logic programming languages (such as PROLOG) which were praised decades ago and indeed looked evenly promising are almost obsolete today. Exploratory programming looks equally promising. Will it shape the programming world to new heights? Will it be adopted by professionals? Is it a Big Idea? Let’s see if it lives up to expectation. I find scheme to be a good way of exploring other ways of programming. The teach-pack in Scheme make programs more obvious to understand… you remember the celsius program? You are the only lecturer who talks about technology and the people who developed them. Its encouraging and insightful. Nice of you to say that. I think it’s essential that students know who have invented the tools they use and why. It’s a good way to appreciate the tool and to (maybe) predict what the future will be. What is more interesting is to invent something new. After Scheme, are you planning or do you have in mind to teach Ruby/Rails? I will teach Prolog for the next two week and then swiftly move to Ruby for one month. I don’t intend to teach Rails though. I’ll focus on the scripting and metaprogramming capabilities of Ruby.